It's not all Wurzels and cider! With its dramatic coastline, wild moors of Exmoor National Park, tranquil willow producing wetlands, harbours, marinas and ancient woodlands, Somerset is a wonderful area to explore. Great for cycle routes, scenic walks and wildlife watching. We provide a wonderful holiday experience where you can enjoy the beautiful Somerset countryside, nature and wildlife, which is only a short distance from Bath, one of England's most attractive cities. The Kingfisher Lodge provides the perfect location for enjoying all that Somerset and Wiltshire has to offer and is a fabulous place for children to enjoy, with the enclosed play area and high tech games room. A warm welcome awaits you at Purbeck Holiday Lets, where upon your arrival you will receive a welcome pack, with a few essentials along with some helpful local information, to get you started on your self catering holiday. There are no hidden extras, electricity, bed linen and towels are all included in the price. A Continental breakfast is offered upon request. Four genuine solid wood Scandinavian log cabins encircled by trees for your privacy yet open enough to let sunlight through. We aim to give you that cosy, romantic log cabin retreat experience with a solid wood burner, skylights over the beds for star gazing and a balcony for dining al-fresco. Each fully equipped bespoke self catering log cabin is exclusively designed for all your needs and is perfect for all year round short breaks or even a long holiday. The lounge, kitchen and dining room are open plan and arranged with modern day living in mind. The kitchen is fitted with a gas hob & electric fan oven, dishwasher, fridge/ freezer, microwave and all the crockery you will require. The lounge has a colour lcd television with dvd player. The cast iron wood burner is your focal point creating that warm cosy atmosphere. A patio door leads to the balcony. The Dining Area consists of table & chairs with a picture window to spot the resident wildlife and overlooking a private area serving the log cabin. A skylight is positioned over the table area which helps bring the woodland into the cabin. The bathroom has a very generous sized modern shower cubicle and the cabin itself has wider doorways.The second cabin has a P shaped bath with shower within protected by curved glass. There are two bedrooms at the rear of the cabin which are cosy and tastefully decorated. There is one double bedroom with plenty of room for a cot and a triple room (bunk beds with a double bed as the base). Master bedrooms has a skylight over the bed. Although all cabins are similar, there is a slight variation to properties: some have a 'P' shaped bath with curved shower enclosure, plus some have 2 or 3 single beds in second bedroom. A luxurious lodge designed exclusively for couples, set in the stunning Somerset countryside.. 2 steps to entrance. Living area: With 48" 3D Smart TV, Blu-ray player with a selection of DVDs, Sonos music system, CD player and French doors leading to decked area. Kitchen area: With electric oven, induction hob, microwave, dishwasher, espresso machine and washer/dryer. Study area: With a selection of books and games. Bedroom 1: With super kingsize bed, 40" 3D Smart TV, patio doors leading to decked area and en-suite with bath, shower attachment, double shower cubicle, toilet and heated towel rail.. Heating (underfloor in en-suite), electricity, bed linen, towels and Wi-Fi included. Decked area with garden furniture, sun loungers and barbecue. 7-acre grounds with fields, parkland and orchard (shared with other properties on-site). 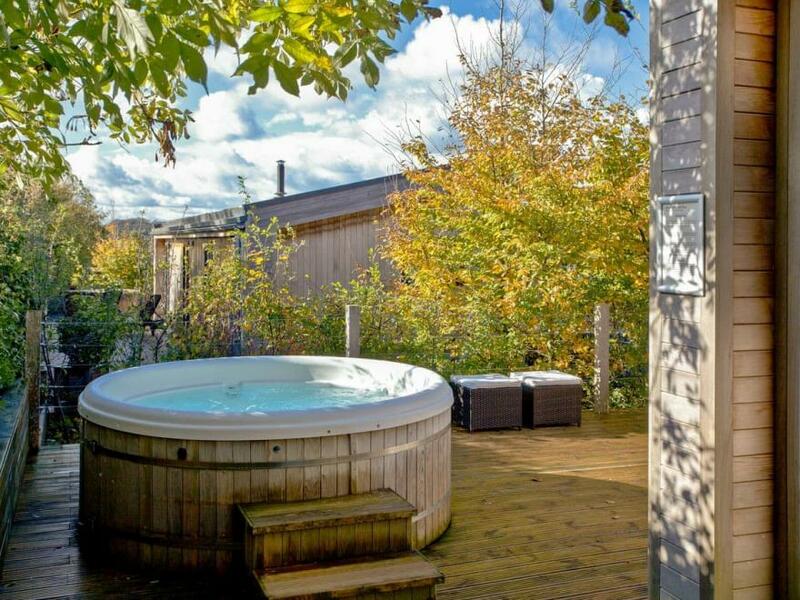 Hot tub (private). Private parking for 1 car. No smoking. 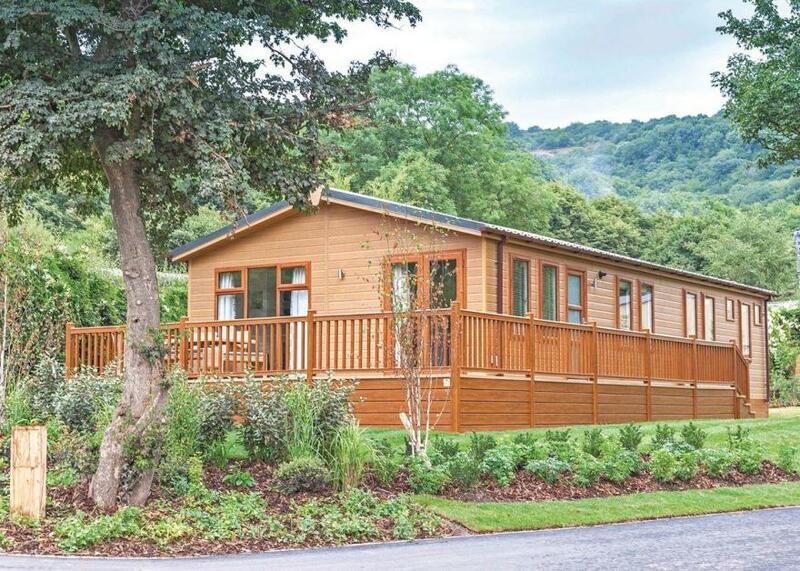 Please note: This property has a security deposit of £125.. Amber Lodge is one of the largest lodges on-site and has one bedroom, but is the same size as a standard two bedroom lodge. Consequently, the bedroom suite and the living area are both exceptionally spacious and airy with wonderful views. You’ll find a super kingsize bed, high thread count cotton bed linen, 40” 3D Smart TV and solid oak chests of drawers in the bedroom. Relax in, and enjoy, the double-ended bath, double shower and underfloor heating in the large en-suite bathroom, complete with robes and slippers. 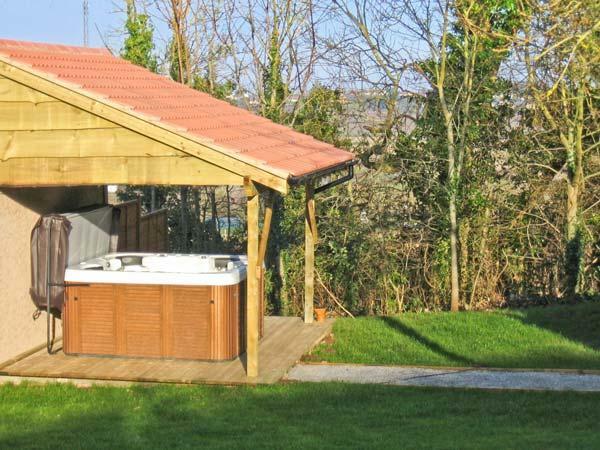 Amber Lodge offers superb views of the Mendip Hills – an Area of Outstanding Natural Beauty –which can be enjoyed from living areas and bedroom alike, or while sipping something bubbly in the hot tub or relaxing on the sun loungers. Guests can also dine al fresco on the large wrap around decked area complete with barbecue, while savouring the Somerset countryside. Ash Lodge is a detached barn conversion in Washford, Somerset. With an unusual layout, it sleeps eight in four bedrooms. On the first floor there are two eaves twin bedrooms, and on the ground floor there is a double and a twin. There is a wet room on both floors, and on the ground floor there is an open plan living area with a kitchen, dining area and a sitting area with a woodburner. The first floor is only accessed via an external staircase. Outside there is a decked patio and a private hot tub. 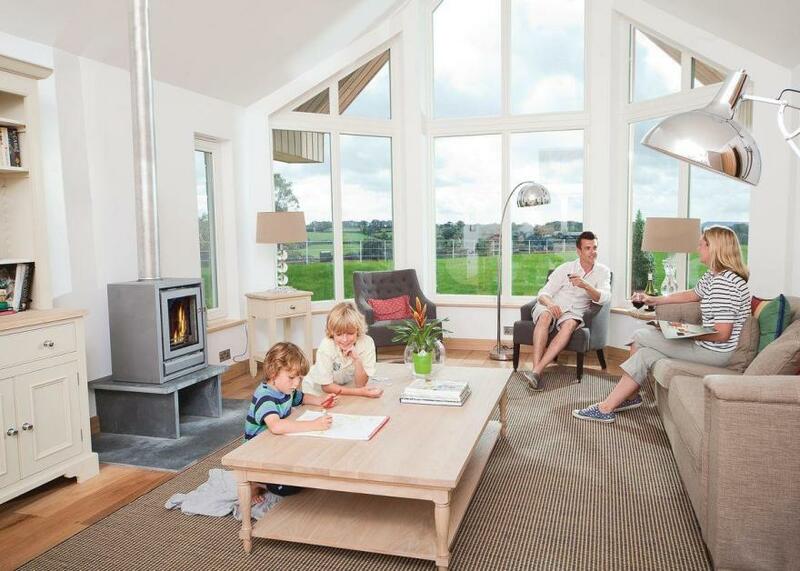 Ash Lodge is an unusual barn conversion, ideal for two families holidaying together. Beautifully presented spacious and luxurious lodge with two double, one with contemporary styled ensuite shower and one triple room comprising of a single and a bunk. Spacious bathroom featuring luxurious freestanding bath and separate shower. Spacious open plan lounge featuring a modern, sleek fireplace and an elegant diner area. Stylish modern kitchen area featuring coffee machine, soup and smoothie maker, fondue and cocktail set along with a dishwasher and washer/dryer. Patio doors leading to spacious decking area with gas barbecue. Early check-in included. Perfect for a luxury escape with family.. Cheddar Woods Resort & Spa is part of our Go Active+ Breaks Collection, nestling on the slopes of the beautiful Mendip Hills and affording spectacular views of the Somerset countryside. Perfectly placed for enjoying the South West’s numerous delights, this is a superior base for a family holiday taken entirely at your own pace. Boasting decadently furnished lodges, some complete with outdoor hot tubs, this fabulous park brims with activities to suit everyone. The Eden spa is perfect for those looking for a tranquil break or for the more adventurous there is an abundance of activities.. Cheddar Woods Resort & Spa is part of our Go Active+ Breaks Collection, nestling on the slopes of the beautiful Mendip Hills and affording spectacular views of the Somerset countryside. Perfectly placed for enjoying the South West’s numerous delights, this is a superior base for a family holiday taken entirely at your own pace. Boasting decadently furnished lodges, some complete with outdoor hot tubs, this fabulous park brims with activities to suit everyone. The Eden spa is perfect for those looking for a tranquil break or for the more adventurous there is an abundance of activities.. Including windsurfing, sailing, canoeing and kayaking. Contemporary and spacious lodge. One master double with contemporary styled ensuite shower and two twin. Bathroom. 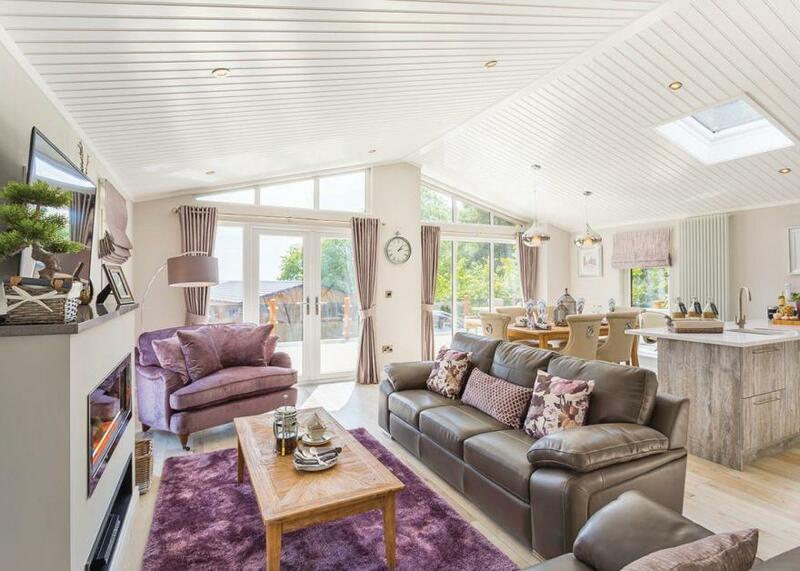 Stylish open plan living space including large contemporary kitchen, dining area and lounge. Patio doors leading to spacious decking area for al fresco dining. Perfect for a break with family or friends.. Cheddar Woods Resort & Spa is part of our Go Active+ Breaks Collection, nestling on the slopes of the beautiful Mendip Hills and affording spectacular views of the Somerset countryside. Perfectly placed for enjoying the South West’s numerous delights, this is a superior base for a family holiday taken entirely at your own pace. Contemporary and spacious lodge. One master double with contemporary styled ensuite shower and two twin. Bathroom. Stylish open plan living space including large contemporary kitchen, dining area and lounge. Patio doors leading to spacious decking area with outdoor hot tub and garden furniture for al fresco dining. Perfect for a break with family or friends. . Cheddar Woods Resort & Spa is part of our Go Active+ Breaks Collection, nestling on the slopes of the beautiful Mendip Hills and affording spectacular views of the Somerset countryside. Perfectly placed for enjoying the South West’s numerous delights, this is a superior base for a family holiday taken entirely at your own pace. 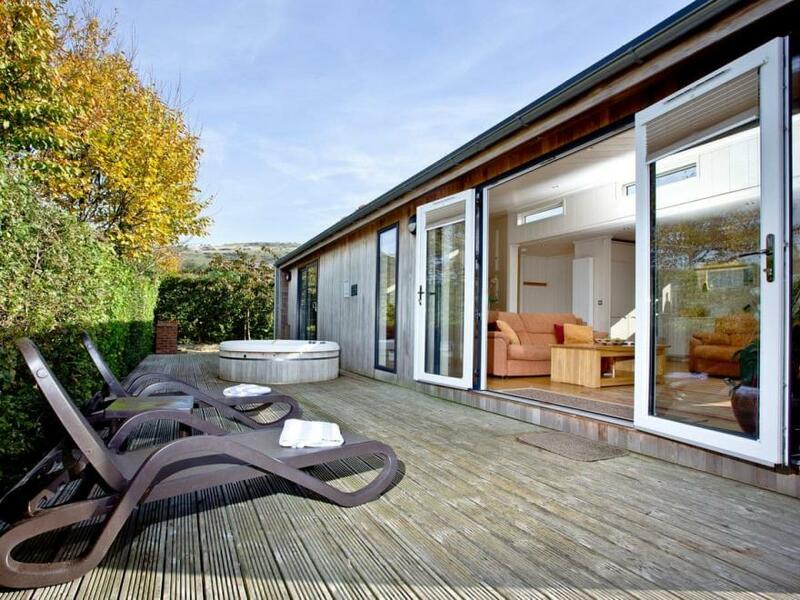 A stunning eco-lodge located in the beautiful Somerset countryside.. 2 steps to entrance. Living area: With wood burner, 40" Smart TV, Blu-ray player and French doors leading to decked area. Kitchen area: With breakfast bar, electric oven, gas hob, microwave, fridge/freezer, dishwasher, coffee machine, washer/dryer and DAB radio. Bedroom 1: With kingsize bed, 24" Freeview TV, patio doors leading to decked area and en-suite with shower over bath, toilet and heated towel rail. Bedroom 2: With zip and link super kingsize bed (can be twin beds on request), 24" Freeview TV and en-suite with double shower, toilet and heated towel rail.. Heating, gas, electricity, bed linen, towels and Wi-Fi included. Logs for wood burner available on-site. Cot and highchair. Decked area with garden furniture. 14-acre grounds with fields, parkland and orchard (shared with other properties on-site). Hot tub (private). Private parking for 2 cars; additional parking, 100 yards away. No smoking. Please note: This property has a security deposit of £100.. Blackbird Lodge is set within a development of contemporary eco-lodges at Strawberryfield Park, nestled on the fringe of the Mendip Hills, an Area of Outstanding Natural Beauty and the perfect setting to enjoy tranquil countryside views. Internally, Blackbird Lodge has an ultra-modern look and is furnished to the highest standard throughout. The spacious living areas are made to feel bright and airy with the large windows and glass doors providing ample natural light. On the colder evenings, warm yourself up using the state of the art wood burner - perfect for a cosy winter break. 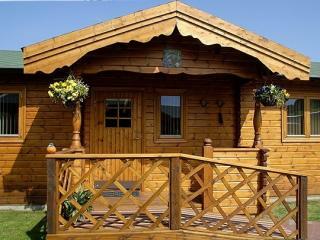 Externally, the lodge features a decked area complete with a hot tub. This is a wonderful spot to sit in the afternoon sunshine with lunch, or simply relax in the hot tub after a day of exploring the local area. Stunningly designed contemporary lodge. One king size double and one twin, one with ensuite shower and French doors to patio, one with ensuite bath. Additional WC. Spacious open plan living area with an impressive vaulted ceiling. Modern kitchen and dining space and floor to ceiling windows for a light and spacious environment. Patio for al fresco dining.. Swandown Lodges is part of our Evermore Lodge Holidays Collection, enviably set within the breathtaking parkland of the renowned historic Cricket St Thomas Estate on the Dorset/Somerset border. Equidistant between the bustling market towns of Crewkerne and Chard, shopping opportunities and an array of historic and cultural gems abound in the local area.. Swandown Lodges is part of our Evermore Lodge Holidays Collection, enviably set within the breathtaking parkland of the renowned historic Cricket St Thomas Estate on the Dorset/Somerset border. Our delightful single storey lodges in Somerset enjoy views over a stream and grasslands beyond which lies the Taunton-Bridgwater Canal. The main living space is open plan with a central hallway leading into one double bedroom and one twin bedroom and the family bathroom. 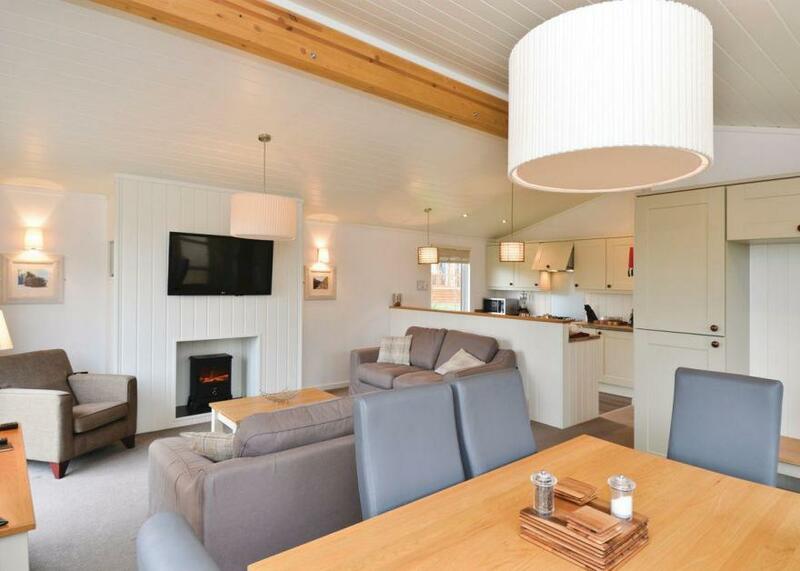 Lakeview’s luxury Lodges enjoy a spacious, bright and airy Kitchen /dining area / Lounge being fitted with solid oak kitchen units finished with granite worktops, including integrated dishwasher and washing machine, electric hob and oven, with free standing fridge/freezer and a microwave. 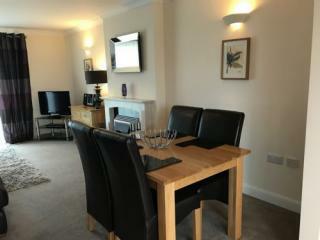 Table and chairs and side tables to the dining area and lounge, including Leather sofas freeview flat screen TV, DVD player and CD player and free Wi-Fi. The spacious Lounge area has thick piled carpet and a contemporary electric fire set into a marble fire surround. Patio doors leading to small al fresco patio, garden furniture and a private lawn area. A Kingsize bed to the master bedroom and twin single beds in the second bedroom. Both bedrooms are fitted with dressing table to master bedroom, thick pile carpet and a combination of down lighters and side lamps to both bedrooms. All beds are made up prior to your arrival with high grade linen sheets and soft pillows and duvets. Spare pillows are available upon request and thick fluffy towels are provided in all bathrooms. The Bathroom is fitted with beautiful ceramic tiles in a contemporary style, bath with over head shower, WC and wash hand basin, complete with heated towel rail. Two of our self-catering Lodges in this style (Willow Lodge and Meadow Sweet Lodge) benefit from having a contemporary wet rooms in place of the bath. Please call to request these specific lodges.